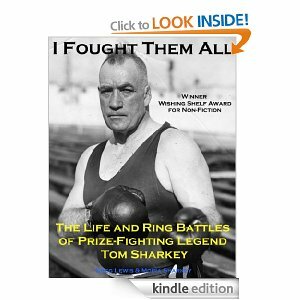 Sharkey arrived in the United States in the 1890s as the fight game was changing. The prize-fighters and bare-knuckle brawlers were disappearing as the new “scientific” boxers emerged to fight under the Marquis of Queensberry rules. After quickly making his name as a mean brawler, Sharkey went on to battle all the top boxers of his day: his hero John L Sullivan, Gentleman Jim Corbett, Bob Fitzsimmons and the man who would become not only his greatest foe but his best friend, Jim Jeffries. And, despite the viciousness of their ring battles, they went on to enjoy a 50-year friendship which only ended when they died weeks apart. The award-winning biography I Fought Them All prints the fact and the legend, and is chocked full of the rich characters who dominated the sport and politics of the period, from Wild West gunman Wyatt Earp to Tim “Dry Dollar” Sullivan of New York’s Tammany Hall. Originally released as a limited edition hardback, I Fought Them All is now available as an e-book on Kindle US and Kindle UK.